It’s the morning after the night before and I can confirm that I have not run off with the circus! But I did finally make it to try out an Aerial Hoop class! I’m feeling a little tender, but not in the usual places. The joints of my fingers ache, my palms are sore, and the back of my knees feel like they would be bruised (if I were the type that bruises easily). Don’t think for a minute though that I didn’t enjoy all 1 hour and 15 minutes of this class! It took me back to my primary school days; the memories of swinging round and round on the climbing frame! It was somewhat easier in those days though as I was fearless and also half the weight I am now! Naturally! The aerial hoop (also known as the lyra, aerial ring or cerceau) is a circular steel apparatus (resembling a hula hoop) suspended from the ceiling, on which artists may perform aerial acrobatics. First things first, the class is for both beginners and intermediate so no circus experience is required! I was unsure what to wear so I opted for some capri leggings, sports bra and long sleeved top. Socks are optional, and shoes are not necessary. A thorough warm up was followed with one heck of a session! The first skill I learnt was getting onto the hoop. Sounds easy? Hmmm. 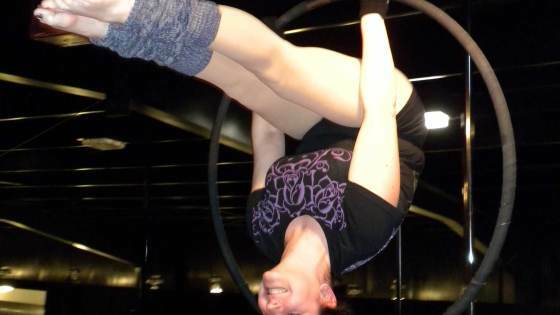 It consisted of hanging from the hoop, bringing my knees to my chest, rolling over into a pike position (as pictured but on the lower end of the hoop), THEN lifting my legs up and over the hoop so it was between my knees. From there, you grab the hoop with both arms, pull your upper body up while you straighten your legs and slide into a seated position. THERE! That made me sweat! …I realised this was all much harder than it looked. It was a great upper body workout though which is an area I need to work on. We did plenty more moves, which all began with the above just to get on the hoop. One of my favourites was called ‘man on the moon’; it looked and felt very elegant. I have detailed the short term effects in the introduction to this review and I fear that DOMS (delayed onset of muscle soreness) will set in fully tomorrow. The long term effects though are much more desirable! It’s a great upper body workout with lots of arm, shoulder and core strength involved. Check out the Drill Packs for Arms & Shoulders and your Core to get a head-start. It will also improve your flexibility over time, and your control. There was no cardio element to this class but I still worked up a sweat. Drop in classes cost £18, however you can make a saving if you book a course. Check out the Flying Fantastic website for all the information! If you wait for the perfect conditions, you’ll never get anything done! Get out there, try new things and you will reach your goals! Previous Post Paella; but not as you know it! Sounds like you got a great workout Elle, I'm sure I couldn't come close to hanging with you, pardon the pun… I'm not sure anything like this exists anywhere close to me, which may be a good thing for me! Hope your not too sore. Paella; but not as you know it!